Whether served as a side vegetable or as the main entree, grilled vegetable kababs are an easy, colorful, and tasty dish to include at your summertime cookout. In this recipe, the vegetables are first marinated in a Dijon-herb mixture and then grilled, resulting in vegetable kebabs that are bursting with flavor. Use as a side dish to grilled meats or simply serve by themselves over a bed of couscous. Mix olive oil, vinegar, lemon juice, mustard, basil, parsley, garlic, salt, and black pepper together in a small bowl. Place cut vegetables in a resealable plastic bag. Pour marinade over vegetables, toss to coat, and seal bag. Place bag in the refrigerator and let sit for 1 to 3 hours. Preheat grill to medium heat. 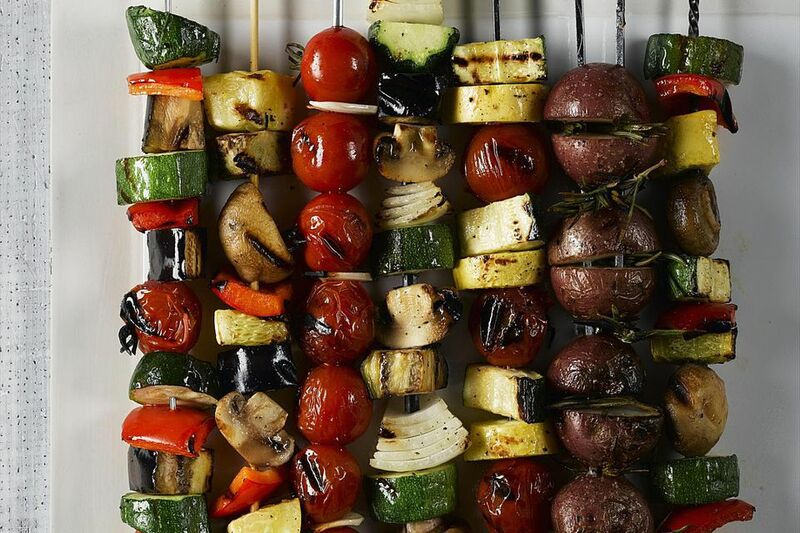 Place vegetables, alternating as you go, on skewers. Reserve marinade to brush vegetables as they cook. Place kebabs on grill and cover. Cook for 10 to 12 minutes, brushing with marinade every 2 to 3 minutes and rotating the skewers to cook the vegetables evenly. Remove kababs from grill when the vegetables are brown and tender. You can use wood or metal skewers for grilling kababs. If using wood skewers, you may want to soak them in water for about 10 minutes before sliding on the vegetables, especially if the skewers are thin or split easily when you add the ingredients. If you use metal skewers, make sure they are long enough that the handle is not directly over the heat; you might need to keep a burner off to create a cool side of the grill. Use heat-proof gloves when removing the kababs from the grill. In addition to a side or main dish, these vegetable kebabs are great as appetizers. Just use shorter skewers for individual portions and serve with a dip or vinaigrette. The grilled vegetables are also delicious stuffed into a warmed pita for a healthy and filling lunch or as a topping for a rice bowl along with grilled chicken and ancient grains. The vegetables in this recipe create a nice variety and plenty of colors, but you can adjust the selection to suit your taste. Consider using cherry tomatoes, green zucchini, and even sweet potatoes. Just be sure to cut them into similarly sized pieces so they cook at the same rate. This is a great basic marinade that would also be tasty on chicken or seafood. Adjust the fresh herbs to your liking. Try fresh oregano, tarragon, or dill instead of the basil and parsley. For a Mexican marinade, use a lime instead of lemon, omit the mustard, add a few shakes of hot sauce and use fresh oregano and cilantro instead of basil and parsley.